Although BMI (body mass index) is controversial because a higher BMI is not necessarily indicative of poor health, according to an American Cancer Study, for every one-point increase in BMI, there is a 4 percent rise in breast cancer risk. BMI is calculated using a person’s height and mass to get their relative weight or, to put it another way, their thickness or thinness. You can use the American Cancer website to calculate your BMI. If your BMI score falls between 18.5 and 25, you fall into the “normal weight” category. However this does not necessarily mean that your risk of breast cancer is low. To reduce breast cancer risk, it is best not to even be in the upper half of the “normal weight” category. Even with a “normal weight” BMI, especially after menopause, most women have a hard time avoiding adding this type of fat. There is a known correlation between cancer risk and abdominal fat. One study published in Cancer showed breast cancer patients had 45% more visceral fat than healthy women. According to the National Cancer Institute this abdominal fat-breast cancer connection may be because extra fat changes the hormonal landscape in the body, creating excesses of hormones like estrogen. 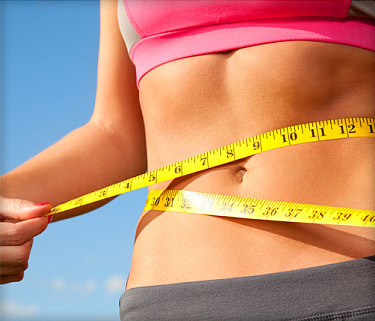 The good news is that abdominal fat yields fairly easily to exercise and diet. So what can we do about tubby tummies? The starting point for combating abdominal fat is regular moderate-intensity physical activity — at least 4 or more times per week for 45 to 60 minutes in your target heart zone (intense enough that you would rather not talk while exercising). This should also include some strength training (exercising with weights) as well. Spot exercising, such as doing sit-ups, can tighten abdominal muscles, but it won’t get at visceral fat. Diet is also important. One of the best diets to reduce BMI and abdominal fat is offered by the Wellness Forum and Dr. Pam Popper, a nationally well-known nutritional expert. It is a no-dairy, plant-focused diet based on a food pyramid with a minimum of 64 ounces of water, loads of veggies and only an occasional treat. (Organic meat two to three times a week is optional). To see how healthy you are, take the Wellness Forum Personal Health Assessment and then check out their recommendations for Dietary Excellence and Optimal Habits. You can also order Dr. Popper’s e-book Food Over Medicine for only $2. (If you are really inspired, a basic Wellness Forum Membership costs $77). This post provides some very useful information. Thank you for that. However, I’m very sorry to see the commercialized aspects, such as recommending and linking to a particular book, and an associated $77 (!) membership plan, and the ‘six-pack ab’ photo at the top, reflecting some idealized and (for most of us) unachievable notion of physical fitness. In my opinion, these commercial aspects are entirely unnecessary and only compromise the message you’re trying to convey. You have some valid points. However, most people will not respond to general info about losing weight. Although there may be other good ways to lose weight, we featured the Wellness Forum’s program because we have tried it and know through personal experience that it works. Also it is very inexpensive. The personal Health Assessment is also a Wellness Forum tool. None of the fats mentioned in the survey are particularly healthful (salad dressings, cooking oils, packaged foods). While some other fats may be more healthful, most people are totally unaware of actually how much fat they consume. Realizing this and learning to limit fat intake is extremely important in lowering BMI. The Health Assessment Survey was developed by Dr. Pam Popper who is a naturopath, an internationally recognized expert on nutrition, medicine and health, and the Executive Director of The Wellness Forum. Dr. Popper serves on the Physician’s Steering Committee and the President’s Board for the Physicians’ Committee for Responsible Medicine in Washington D.C. Dr. She is also part of Dr. T. Colin Campbell’s teaching team at eCornell, teaching part of a certification course on plant-based nutrition. She has been featured in many widely distributed documentaries, including Processed People and Making a Killing and appears in the film, Forks Over Knives, which played in major theaters throughout North America in 2011. She was one of the co-authors of the companion book which was on the New York Times bestseller list for 66 weeks. Her most recent book is Food Over Medicine: The Conversation That Can Save Your Life. Wishing you all the best in your own personal quest for good health. ps. And the “Personal Health Assessment” (http://wellnessforum.com/docs/PersonalHealthAssessment.pdf) which is promoted here seems rather outdated. There are many lifestyle surveys available. Where did this particular survey come from? The Mayo Clinic? Cleveland Clinic? Has it been vetted by relevant professionals in the field? Answering “More than once per day” raises one’s score, where a high score requires lifestyle changes. But, current research indicates that high intake of (good) fats is potentially protective against disease, including cancer. This question was the ‘red flag’ to me, that an informed physician has not reviewed may not have reviewed this survey. I don’t mean to be overly critical… but the above concerns me, if readers take this survey at face value and trust that a good physician has endorsed it.